He’s seen a doctor and he’s grand now. The band on stage last night in Cologne. BONO’S GOT HIS voice back and U2 have returned to their tour on schedule after being forced to abandon a show in Berlin at the weekend. The Saturday night show was cut short after only a handful of songs after the singer suffered a complete loss of voice. “The band were in fine form in Cologne tonight, the tour right back on track after Saturday’s cancelled show,” a post on U2′s official website said. Footage posted online of their performance showed the singer and the rest of the group performing as normal, to a capacity crowd. A statement from Bono, confirming he was back to his usual form, was posted on Sunday. “I’ve seen a great doctor and with his care I’ll be back to full voice for the rest of the tour,” he said. There was an amazing atmosphere in the house, it was going to be one of those unforgettable nights but not for this reason… We can’t wait to get back there on November 13th. More information about the rescheduled Berlin show will be confirmed later, according to the website. 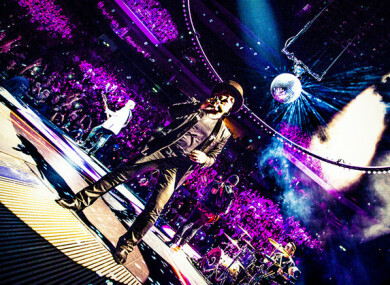 U2 are due to play two night in Belfast and four in Dublin later this year as part of their Experience + Innocence tour. Email “Bono's got his voice back and U2 have returned to the road ”. Feedback on “Bono's got his voice back and U2 have returned to the road ”.